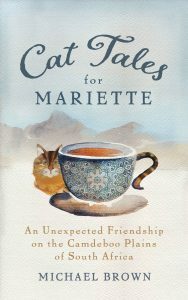 Laurie Huston from News the Heart is talking with author Michael Brown on his New book: Cat Tales for Mariette: An Unexpected Friendship on the Camdeboo Plains of South Africa. Michael embarks on leading us through a touching story about A solitary author, a dying widow, and a love of cats weave together to create a touching story about hopes, regrets, and the gift of friendship. 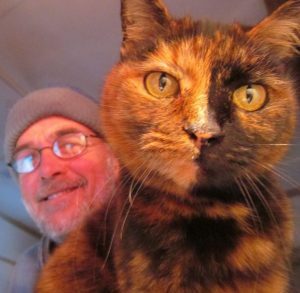 We explore our relationship with cats (and pets) and how they interact in our lives, from opening our Hearts, offering Spiritual guidance to teaching us about death… pets are important in our lives! Set in the dusty Karoo desert town of Aberdeen, South Africa, Cat Tales for Mariette tells of the unexpected friendship that forms between Michael Brown and a dying woman, Mariette Van Wyks. The two bond over Michael’s sharing of cat stories from his many years of life shared with cats. Mariette’s unfulfilled longing to experience the presence of cats in her life comes to fruition through cat tales over tea and cookies in the hospital. As Mariette takes the final steps of her journey, these stories magically bring insight, healing, and resolution to her past and also to Michael’s. Join us for this fascinating discussion! We’re Getting to the Heart of what Matters! A solitary author, a dying widow, and a love of cats weave together to create a touching story about hopes, regrets, and the gift of friendship. Set in the dusty Karoo desert town of Aberdeen, South Africa, Cat Tales for Mariette tells of the unexpected friendship that forms between Michael Brown and a dying woman, Mariette Van Wyks. The two bond over Michael’s sharing of cat stories from his many years of life shared with cats. Mariette’s unfulfilled longing to experience the presence of cats in her life comes to fruition through cat tales over tea and cookies in the hospital. As Mariette takes the final steps of her journey, these stories magically bring insight, healing, and resolution to her past and also to Michael’s. Expanded Bio: Until 1989 South African-born Michael Brown was living what he calls ‘a blissfully unconscious life’ as a music journalist. He edited both Top 40 Music Magazine and Flipside SA Music Magazine, as well as writing scripts for Toyota Top 20 Music Television. During this period of his life, Michael developed an acutely painful neurological condition called Horton’s Syndrome, a cross between Cluster Headache and Migraine. After years of suffering through conventional medical and alternative approaches, he embarked on a quest to integrate the painful experience through personal inquiry. This self-examination, which took him on a journey across the United States and Mexico, led to the revelation of the role negatively-imprinted emotional patterns play upon the quality of our daily felt-experiences, and the possible release and relief gained through their conscious felt-integration. As Michael’s quest for resolution unfolded, he began adopting a behavioral posture he now calls, ‘conscious emotional response’ – an approach to life rooted in embracing absolute personal emotional responsibility for all uncomfortable felt-experiences. He discovered that his repeated application of ‘conscious emotional response’, as opposed to, ‘unconscious emotional reaction’, completely transformed the quality of his experience. In the late 90’s Michael returned to South Africa and began to develop a practical, self-facilitating procedure to awaken and develop the capacity for conscious emotional response, a procedure designed to be accessible to anyone, anywhere, who wanted to transform the quality of their own felt-experiences. In 2002 Michael invited others to take this inner journey through one-on-one facilitation. He discovered that when embracing the attitude and behavioral approach of conscious emotional response, they too automatically experienced unfolding integration of physical, mental, and emotional felt-discomforts, including psychological disorders and addictions. 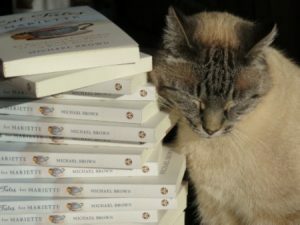 Michael’s next step toward making this journey accessible to everyone was to write The Presence Process: A Journey Into Present Moment Awareness, which was published by Namaste Publishing in 2006. As a consequence of his own evolving experience, Michael revised the procedure and updated the book in 2010. The Presence Process is now published in 12 languages. In 2007, drawing directly from insights gained during the sharing of The Presence Process in presentations and through one-on-one facilitation, Michael wrote Alchemy Of The Heart, now also published by Namaste Publishing. Many have said, ‘Alchemy Of The Heart is the book to read first’, as it mentally prepares the reader for the direct emotional experience entered in The Presence Process procedure. Michael departed the public arena of teaching, presentation and facilitation in 2008 and currently lives in the semi-desert region called The Karoo, in Aberdeen, South Africa. 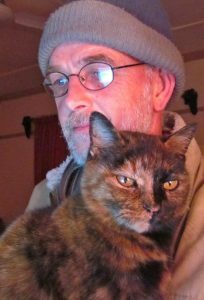 His latest book, Cat Tales For Mariette, is due for release by Namaste Publishing on 11 Oct 2016. The Presence Process is now available in 15 languages, including: Arabic, Simplified Chinese, Croatian, Danish, Dutch, Slovene, Spanish, Turkish, English Reprint, Indian, French, German, Italian, Korean, andSerbian. This entry was posted in Archives and tagged Author, Cat Tales for Mariette, Intuitive Counseling, intuitive counselor, Laurie Huston, Michael Brown, News for the Heart, News for the Heart Radio, role of pets. Bookmark the permalink.